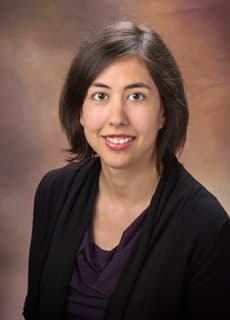 Ana Maria Cardenas, PhD, D(ABMM), is Director of the Infectious Disease Diagnostics Laboratory at Children's Hospital of Philadelphia. S. Montgomery, K. Roman, L. Ngyuen, A.M. Cardenas, J. Knox, E.H. Graf. Prospective evaluation of light scatter technology paired with MALDI-TOF mass spectrometry for rapid diagnosis of urinary tract infections. J Clin Microbiol. 2017 Jun;55(6):1802-1811. doi: 10.1128/JCM.00027-17. Epub 2017 Mar 29. Danielle Fortuna, Ana María Cárdenas, Erin H. Graf, Larry A. Harshyne, D. Craig Hooper, John Shields, and Mark T. Curtis. Human parechovirus and enterovirus initiate distinct CNS innate immune responses: pathogenic and diagnostic implications. J Clin Virol. 2017 Jan;86:39-45. doi: 10.1016/j.jcv.2016.11.007. Epub 2016 Nov 23. Graf EH, Farquharson MV, Cárdenas AM. Comparative evaluation of the FilmArray meningitis/encephalitis molecular panel in a pediatric population. Diagn Microbiol Infect Dis. 2017 Jan;87(1):92-94. doi: 10.1016/j.diagmicrobio.2016.09.022. Epub 2016 Oct 1. Yeh-Chung Chang, Justine Shults, Ana Maria Cardenas, Charles Branas, Kristen Feemster. Impact of a Clinical Pathway and Rapid Direct Influenza Polymerase Chain Reaction Test Introduction on Appropriate Testing and Treatment Among Nonhospitalized Children With Influenza-Like Illness. DOI: 10.1093/ofid/ofw172.109 (ID week), 2016.